in the least acrimonious way possible. Nevada District Court only takes jurisdiction over children that have lived in Nevada with you for a minimum of six (6) months. At that point, Nevada is considered the “home state” of the children and the Court will pass rulings on physical custody, visitation, and child support. EXCEPTION: If you can show an “emergency” under the Uniform Child Custody Jurisdiction Act, a Nevada judge can make rulings over children who have not resided in Nevada for six months. Such cases can become complicated. In order to protect your children’s rights and your own rights, we highly recommend that you contact us so that Attorney James E. Smith can advise you on your best course of action. If you find it difficult to make a decision regarding physical custody, visitation, and child support , consider addressing those issues with a professional, licensed, mediator before filing your Nevada divorce. Many divorcing people with children (and, or, with property to divide),find that they benefit greatly from meeting with a mediator prior to filing their divorces. Through the mediation process, you’ll come to decisions regarding your children that work for both parents and, most importantly, for the children. Leaving it up to a judge in a divorce trial, as well-intentioned as she or he might be, never makes anyone happy because the decision is made by someone who knows little of you, your children, and your life. Both parents must attend a COPE class. If one of the parents resides out of the State of Nevada, then an effort to find a comparable class in another state must be made. If none can be found, then a Motion for a class waiver must be filed with the Court. In all cases, the class will be waived for Defendants who resides outside the U.S. If you both live in the same city in Nevada, you may take the class with your soon-to-be ex-spouse, or each of you can take it separately, as long as you take it. Each of you will need to file your Certificate of Completion with the Court. If one of the parties to a Nevada divorce refuses to attend a COPE class, he or she can be held in contempt of court — and a judge can withhold visitation until the class is completed. This simple chart should help you easily figure out the amount of child support you would be expected to pay should a judge make the decision for you. You can, of course, pay a higher amount if you wish. Statutory percentages: NRS 125B.070 (1)(B):One (1) child: 18%Two (2) children: 25%Three (3) children: 29%Four (4) children: 31%Five (5) or more children: 2% more over amount for four (4) children for each additional child. 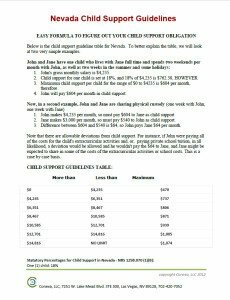 Jane makes 800 per month, so must pay $144 to John as child support. Difference between $180 and $144 is $36, so John pays Jane $36 per month. 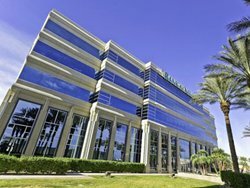 In Nevada, customarily, both parents assume legal custody of their children, no matter with which parent a child spends the most time.To take away legal custody from one parent, you must prove that the parent in question is dangerous to the well-being of the child in some way.These days, the courts like to see an equal time split between the parents, and will generally award split physical custody, provided it works to the advantage of the children. For instance, if one of the parents lives so far from the children’s school that it means the children will spend several hours a day in a car to get to and from school, a judge may well rule that the children be with the parent who lives closer to the school during the week, and visit the parent who lives farther on the weekends.Even if both parents live close to the children’s school, you can opt to have them live at one parent’s house more than at the other. It is not required that the children spend equal time with both parents. It’s considered best for the children if it also works for both parents.It’s always best for the parents to make the decisions on the time split between the children – and if the children are over the age of 13, it’s a good idea to involve them as well.Should a judge have to make the decision on where your “over-13” children will live most of the time, it’s possible that the judge would ask them where they wish to live, as they now have a right to make that decision. If you opt for one parent only to have physical custody, you’ll want to establish visitation for the other parent. There is no absolute rule here, just whatever works for the children and both parents. Again, it’s always best to make this decision yourself. If a Nevada judge makes this difference, it’s likely that visitation will be either every weekend, or every second weekend. It is pretty much expected that at least one parent provide the children with at least basic medical coverage. If you cannot cover your children with health insurance, have an explanation to enter into the Joint Petition or Complaint for Divorce. * Court filing fees and administrative court costs add up to $328 for joint petition divorce ($342 with children), and $364 for a Complaint for Divorce. Cost of process service and publication (when the other party won’t sign or cannot be found) is additional. U.S. average cost is $160 for process service ($125 in urban Nevada); publication $150. Process service outside the US. : costs vary by country and are individual to each case.